Halo Couture hair extensions are an amazingly luxurious extensions solution that can add length and volume to your locks. Available in Toronto hair salons, Halo Couture hair extensions are made from Remy human hair, which is the highest quality real hair extensions available. The effect will look completely natural and gorgeous. 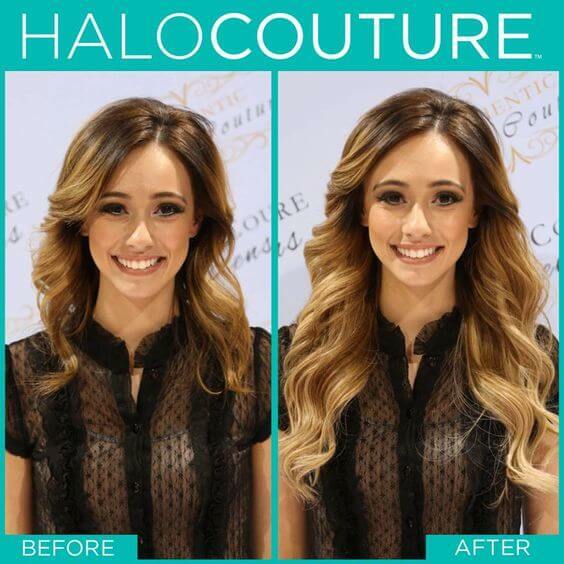 Halo Couture extensions are faster to apply than extensions that must be woven or glued into hair. However, you will still need to have a professional place your extensions for the best results. Allowing a professional to place your extensions will ensure that you get the right color match for your natural hair. And the stylist can also trim and style them to get your desired look. Halo Couture extensions stay in place for months at a time, and the wire used to attach the extensions to your natural hair does not show when attached properly. Who is Halo Couture for? These extensions are perfect for concealing gray hairs, extending periods between touching up your hair colour, and adding volume and length. You can use hair extensions for special occasions to add an extra wow-factor to your style, or just keep them in to make your everyday style more glamorous. You can have these extensions placed whether your natural hair is short, long, thin, or thick. The extensions are available in lengths of 12”, 16”, 20”, and 24”. And you can choose the style that works best with how you wear your hair, whether that’s “The Fall”, “The Ponytail”, or “The Layered Halo”. Hairafter Salon in Toronto carries Halo Couture extensions in a variety of colors, including black, multiple shades of brown and auburn, and warm and cool tones of blonde. Come in today and let one of our stylists help you find the perfect extensions.